The lifestyle world of Automobili Lamborghini is presented at the Geneva Auto Salon 2019, from 7 to 17 March, with a preview of three prestigious collaborations between Lamborghini and its partners. Automobili Lamborghini presented the new Lamborghini Huracán EVO: the next generation V10 super sports car, based on the prowess and performance of the Huracán Performante and incorporating next-generation vehicle dynamic control and aerodynamics.The Lamborghini Huracán EVO features the 5.2 l naturally-aspirated Lamborghini V10 engine, uprated to produce higher power output and an emotional and powerful sound, with Titanium intake valves and refined lightweight exhaust system. The Huracán EVO outputs 640 hp (470 kW) at 8,000 rpm with 600 Nm of torque delivered at 6,500 rpm. With a dry weight of 1,422 kg the Lamborghini Huracán EVO reaches a weight-to-power ratio of 2.22 kg/hp, accelerates from 0-100 km/h in 2.9 seconds and from 0-200 km/h in 9.0 seconds. Braking from 100 km/h to 0 is achieved in just 31.9 m, with a top speed of more than 325 km/h. Automobili Lamborghini unveils two new open-top models at the 2019 Geneva Motor Show: Huracán EVO Spyder and Aventador SVJ Roadster. Watch this Interview with Stefano Domenicali, CEO of Lamborghini. The Jeep brand showcased a collection of major new products at the 89th Geneva International Motor Show.The year of 2018 was the best ever for the Jeep brand in Europe with record sales in many markets across the continent, including Italy, Germany, Spain, France, Belgium, Poland, Switzerland, the Netherlands and Portugal. Jeep was the fastest growing brand in the region in 2018 with sales up by 56% compared to 2017.It was the fifth year of uninterrupted growth in Europe and the third which saw sales of over 100,000 units. The Jeep Compass was the best-selling model in the range, followed by the Jeep Renegade, which also continues to be one of the top-selling vehicles in its segment. In third spot, the new-generation Wrangler, which recorded its best year ever in Europe and a sales growth of 86% versus 2017. On the back of these extraordinary results, the Jeep brand will introduce several new special edition models at the show, in response to Jeep enthusiasts' continued and growing demand for exclusive new customisation options: New "S" range - The "S" special edition Renegade, Compass, Cherokee and Grand Cherokee make their European debuts at the Geneva Motor Show. The new Cherokee Trailhawk completes the Trailhawk family with all of the Jeep SUVs now sporting the prestigious "Trail Rated" badge, a symbol that signifies the ability to successfully tackle even the most challenging off-road trails. Display of custom models created with Jeep Authentic Accessories by Mopar, the FCA brand for aftermarket products and services that boasts over 80 years of tradition in performance, safety and style. These further enhance the renowned features which first established the success of Jeep SUVs. A revolution in automotive performance, design and collaboration is revealed with the Pininfarina Battista – the world’s first luxury electric hyper performance GT.Built in Italy, the Battista will be the most powerful Italian-made car of all time. When it arrives in 2020 it will deliver a level of performance that is unachievable today in any road-legal sports car featuring internal combustion engine technology. Faster than a current Formula 1 race car in its 0 -100 km/h sub-two second sprint, and with 1,900 hp and 2,300 Nm torque to hand, Battista will combine extreme engineering and technology in a zero emissions package.2020 also marks the 90th anniversary of the legendary Pininfarina SpA design house, which has taken the design brief for the Battista and produced a classic Pininfarina: an elegant form that seamlessly integrates the car’s innovative engineering solutions that will support unprecedented performance. It is the same design principle of form and function in harmony as seen in classic Pininfarina cars reaching back to the Cisitalia 202 of 1947 and through more than 60 Ferraris, with the latest launched this decade.The Pininfarina Battista’s place in automotive history is defined by its name. 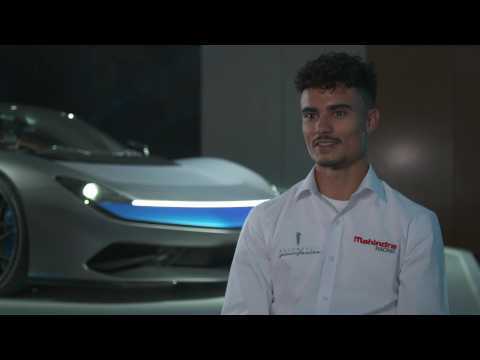 It is the first in a future range of purely electric, zero-emissions, luxury cars solely branded Pininfarina, delivering on a long-held family dream that has been carried by founder, Battista, his son Sergio and current Pininfarina SpA Chairman.